Sometimes little details make you smack your forehead and say, "Of course! How clever!" What are some little-known useful features and small but practical design elements built into everyday things that people either take for granted, or aren't aware of? So I was driving to work this morning with my cup of McDonald's coffee when I realized that instead of flipping the little tab up at the drinking area so it stays stuck to the top of the lid, leaving the hole open; I could instead push it down with my lip and still get a drink without leaving an opening exposed. This is great to prevent splashing while going over bumps while driving. There must be loads of these little "secret features" on various products that we don't even think about, but if we were aware of them would make the minutiae of daily life just a little easier or more comfortable. What are some other examples of these often-unnoticed details? Tabs on soda cans hold your straw for you. Related, and worth checking out: Donald Norman's "The Design of Everyday Things." The first one that comes to mind is the arrow on the fuel gauge on a car's dashboard that tells the driver which side the gas cap is on. Also, the recessed pointy part in the lids of some tubes of creams and ointments that come sealed. Remove the lid, flip it over and press it on upside down to break the seal. There are tabs in the aluminum foil box to prevent the roll from being pulled out (and in most food wrap boxes, like plastic wrap). Funnily enough, related to this question: I just used the "Link" helper on the mobile version of AskMetaFilter and found it super useful, never noticed it before as the iPhone keyboard covers up the link. The lines on Solo plastic cups represent serving sizes in ounces - the bottom one is a shot (1 oz), the next one is wine (5 oz) and then beer (12 oz). The Popular Favorites tab of AskMe. #2 of all time on that list. Ketchup cups at fast food places are designed to be pulled open into a shallow dish, allowing them to hold more and for easier dipping. Little dubious about the soda can/straw thing...I mean who drinks beer with a straw? Maybe more to do with saving weight? Starbucks Oatmeal containers are recessed on the bottom, and are the exact diameter to fit on top of Starbucks coffee lids. Standard size kitchen cabinets are the exact right depth to hold a standard size cereal box - realizing that as a teen was actually the first time I realized the thought that must go into designing anything for mass distribution. This isn't a "secret" because it's really obvious if you've ever ordered one, but the "chicken straws" container at Burger King is a thing of beauty. The back top of the box pulls down a little to make a little cradle for your sauce container, it's just excellent product design. You would probably like some of the episodes in the 99% Invisible podcast. Reddit's Life Pro Tips subreddit, sort by 'All Time'. It gets a little bit more niche in later pages; the top ~30 are pretty obvious or are oft-repeated but there's useful stuff in there too. In the file prompt of almost any program in OSX (where you select what file do you want to attach to this email or what document do you want to open, etc) you can drag the file from Finder or your desktop or whatever into that file prompt and it will automatically jump to the correct path and select the file so you don't have to sit there and browse to it if you already have the file visible. Genius! Not sure if this fits, but when I first became a cyclist in the late '80s I'd stop from time to time, open the lid of my bike bottle, start drinking. So here I am on one of my first group rides when I notice someone else pulling the spout open on the lid and just squirting drink into his mouth. I think "I wish I had bought bottles like that - wait - his bottles look EXACTLY like mine..."
This is not sold as a feature but it's only in the last few years that I've found out that you can get rid of the smell of onion and garlic by rubbing your hands thoroughly on a stainless steel sink. Rubber gloves for washing up can also be used for opening tight lids on jars. On some (not all) browsers, middle-click on a link = open link in new tab. On some (not all) laptops that don't have a middle button, simultaneous left+right click = middle-click. No, this was a replacement for pull tabs, which were a huge source of litter. The modern ones stay on the can, hence no litter. Back to the original question--I don't know if it's a design feature or just an awesome coincidence, but you can get the ketchup to start flowing out of a Heinz glass bottle by smacking your palm on the embossed 57 (bottle upside down, of course). Regarding computers/Internet: if you're given a tracking number, copying and pasting it (or typing it) directly into your search engine will result in the search engine figuring out which tracking service it belongs to and will give you a direct link to that particular shipping website's tracking page for that number. My father was gobsmacked when he watched me slide my gas cap into the little holder on the lid to my gas tank. Also car related: There's a little arrow next to the gas indicator light to remind you which side your tank is on. Handy for when you're driving a rental or someone else's car. There are groves on the bottom of my canister vacuum that when turned on its side, handle up, make a space for the beater bar to attach for storage or carrying up the stairs. Every person I have told this was surprised to discover their machine had this feature too! The diesel nozzle at a gas station is a different size than the unleaded nozzle, which should prevent accidentally putting diesel in a non-diesel car. Not sure if the reverse is true. Prescription pill bottles: The lids can be flipped upside down and simply screwed into the bottle to take them from child-proof to easy opening. This blew my mind when I learned about it. This is not universal. My (2008 model year) car doesn't have one. To the OP: This sort of thing is what Little Big Details is all about. Fantastic info so far! Just to clarify, I'm not really looking for software/computer/OS hacks and tricks. I'm interested mostly in design features & perks built into physical objects and consumer goods. Little things that most people don't realize about the "stuff" they interact with day to day. I find these things fascinating. I've been doing that lid tucking move for years, because of my mom, and I always thought it was well-known. She calls it the "trucker-tuck" and she swears by it. - Spools of thread usually have a small cut in the plastic to hold the loose end of the thread instead of leaving it hanging. - Sewing machines have a built-in thread cutter behind the foot, you just raise up the thread against the edge. - I was surprised when I discovered that my tongs had a tab that when pulled, closed them shut for easy storage. - Tea pot lids often have a small protrusion under their lip, which, when facing the handle, keeps the lid in place when the pot goes a-tipping. That tab on tongs to recite mentions: I can get mine to lock shut just by squeezing them shut and inverting them - gravity lets the tab slide into position. I don't know how long it took me to notice this. The shiny side of foil is the non-stick side! If you don't have the arrow, the hose of the gas pump icon on the dash should also indicate the gas tank side of your car. In Australia, the exit numbers on the freeway are not random, they related to the kilometres distant from the GPO/CBD you are moving away from. Mostly. Exceptions include exit 71A. But handy for knowing how far you have to go. 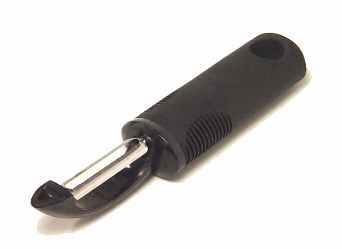 The ground plug on a standard US/Canada cord end is slightly longer than the other two plugs making it a) easier to insert and b) ensuring the device will be grounded before power is available. If you think of the Yellow and Black chevrons on street warning signs for stuff like bridge abutments and islands as pointing down they also point in the direction you need to go to avoid the obstacle. On obstacles where you can go left or right the chevrons are inverted V's and therefor point both directions. The blue reflectors glued to the almost middle of the road show where the fire hydrants are. There's a little hole/sharp place/loop...thing... in the top of some vegetable peelers that you can use to dig/carve the eyes out of potatoes! I hate to be the parade rain, but the gas gauge thing isn't universal, my Honda is one example. And my Solo cups have a pebbled finish, no lines. This is not universally true. My boyfriend used to work as a mechanic and people would often bring their cars in for work because they had accidentally put diesel in the tank instead of unleaded. As the owner of both a diesel and a gasser, I can't imagine getting diesel in to any modern gasser without realizing that you were doing it wrong. The diesel nozzle weighs half again as much as the gas nozzle, stinks of diesel, and will not fit into the orifice. Putting gas into a diesel, on the other hand, would be an easy mistake. This one is obscure and probably unintended, but helps for making your ramen cup-o-noodles. You know the useless piece of cardboard that comes partially wrapped around the package? Well when you've heated up your mug of water and poured it into the cup, while you have to let the cup sit but the paper on top is already compromised, put the cardboard piece on top and rest the mug on top of that for ideal results. I hope that made even the tiniest bit of sense. I am afraid that's not true. No arrow on my Hyundai Elantra, hose on the "wrong" side. The red nylon thread/lanyard that ties the lid of a Chinese clay teapot to its handle doesn't just keep the lid connected to the teapot, but also acts as insulation. You can place your finger on it for a better grip and a burn-free pour. The lid of a gaiwan can sometimes be hooked or wedged in between the bottom of the cup and the saucer, so you don't need to set it down elsewhere.